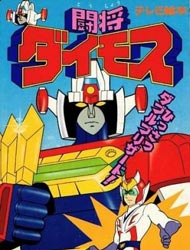 Watch Daimos full episodes online English dub. After the destruction of their home world, the survivors of the planet Barm head toward Earth with the goal of negotiating the purchase of land to emigrate to. Unfortunately, during the negotiations, the Barmian’s leader, Leon, is assassinated by his second in command, Olban, and the delegation from Earth is framed for the murder. In the ensuing chaos, Doctor Isamu Ryuuzaki of the Earth delegation is shot and killed.